The Tobshiba Chomebook 2 has all the qualities of a great Chromebook—light, slim, attractive design, speedy performance, beautiful screen and comfortable keyboard—at an affordable price. If you’re like many people, you do almost all your computing in your browser: checking your email and social networks, creating and sending documents or playing games and videos. So why not use a laptop that is all browser? Any search for a laptop under $400 turns up a Chromebook or three at sites like Amazon or Best Buy and in tech reviews. Notebooks that run Chrome OS, an operating system built entirely around the Chrome browser, are touted as being just as good as traditional machines that run Windows or Mac OS, as long as your needs are simple. Chromebooks are not for power users — not as primary laptops, at any rate — and are only fully functional when they’re connected to the Internet. They're a good choice for grade-school students (and they’re often used in schools), people with basic computing needs who don't stray far from Wi-Fi and people looking for secondary laptops. The first and second generation of Chromebooks were all pretty similar on the inside and outside. Only in the past year have manufacturers started to differentiate with models that stand out due to their design or internal hardware, providing real competition for the best of the bunch. A great Chromebook is inexpensive, lightweight and slim, well-built with a good display and comfortable keyboard, and fast enough to handle multitasking without freezing up or slowing to a crawl. At first glance, several contenders meet at least some of these criteria. Fancier models like the Lenovo ThinkPad Yoga 11e Chromebook ($479) and the Google Chromebook Pixel ($1,299) include touchscreens, 360-degree hinges or other extras that may suit some high-end needs, but these features raise the price too high for a more general audience. In the $200 to $400 range, three models rise to the top: the Dell Chromebook 11, the 13-inch Toshiba Chromebook 2 and the Acer Chromebook 13. Of these, my pick for the best is the Toshiba Chromebook 2, with the Dell in a very close second place. Because Chromebooks usually don't cost much, they don't always have the best hardware components. The place it's most obvious: the display. And that's where Toshiba's Chromebook 2 stands out. The $299 model CB35-B3340's 13.3-inch screen is bright, sports rich colors, offers a full HD 1920 x 1080 resolution and looks good from any angle, thanks to IPS technology. (The lower-end model, the CB35-B3330, has a 1366x768 HD display without IPS technology.) The glossy display means you'll have to deal with some reflections, but the issue is minor. Display quality becomes apparent when you compare the Toshiba with the Acer Chromebook 13, which has a screen that washes out unless you look at it from the exact right angle. Matte displays such as the Acer’s usually look better under bright lights, yet the Acer fares worse in brighter environments. The Dell Chromebook 11's smaller display doesn't have such narrow viewing angles, but it does darken and distort colors as you move off center. Aside from the display, Toshiba also put a great keyboard on this Chromebook, and the touchpad is responsive with no lag or other performance issues. This is true of the other two laptops as well, even the smaller Dell. The 13-inch Toshiba is heavier and larger than most other Chromebooks, which tend to be 11.6 inches like the Dell, but it's still much lighter than comparable mainstream laptops — just under 3 pounds— and it's ultrabook slim. In fact, it’s even slimmer than the Dell, which is 0.97 inches thick and weighs 2.9 pounds. Neither of these laptops is going to give you a backache from carrying it around all day. Since Chrome OS is essentially a browser, you might not think that performance would be a big issue for the laptops that run it. Not true. Web apps, graphics-heavy websites and resource-hogging Java, Flash and other scripts need speedy processors and lots of RAM to run, especially if you want to work with more than one tab at a time. Larger, high-resolution displays require even more power. Chromebooks need to be able to keep up. The Toshiba Chromebook 2 runs on an Intel Celeron processor and 4GB of RAM (the lower end model comes with the same processor and 2GB of RAM). While Celerons aren't the fastest chips, in this environment they provide plenty of power. The Toshiba performed well during normal use, and I didn't encounter any problems I don't experience on any Chromebook (which can lag horribly on Google Drive documents). In the multitasking tests I ran, the Dell was able to complete a spreadsheet macro more than twice as fast as the other two systems, even running resource-intensive websites and streaming a YouTube video. The Acer bested the Toshiba by a few seconds, likely due to its Tegra K1 chip, which Nvidia boasts is just as good for multitasking as it is for graphics and games. The Acer Chromebook 13 does offer impressive graphics performance and is only bested by the Dell due to screen size. It's just that the difference in performance is not so great as to cancel out the poor quality display. For everyday graphics needs — casual games, YouTube videos and so on — the Toshiba Chromebook 2 performs well enough. Since the majority of the work you'll do on a Chromebook happens online, long battery life while connected to Wi-Fi is very important. The Chromebook 2 regularly lasted seven to eight hours, and it sipped power so lightly in sleep mode that not much was lost even after several hours. The Dell Chromebook 11 was able to last around 10 hours and also did well at holding a charge when asleep. Again, a smaller system is much less demanding, but if battery life is your highest priority, this factor is worth considering. The Chromebook 2 has been out about a month and hasn’t yet garnered many professional reviews, but the ones it does have are all positive. Of its great screen, Computerworld remarked that "the impact a display of this caliber has on the overall user experience can't be overstated." Laptop Mag's reviewer particularly appreciated the Skullcandy audio tuning and speaker power. When she cranked the volume up, she said she could hear the entire [music] track clearly from across her apartmentand called the vocals “powerful and crisp." People who've bought the Chromebook 2 are overwhelmingly pleased, and the 1080p model has a 4.4 star rating on Amazon.com. Owners are pleased with the keyboard, the display, and the design. 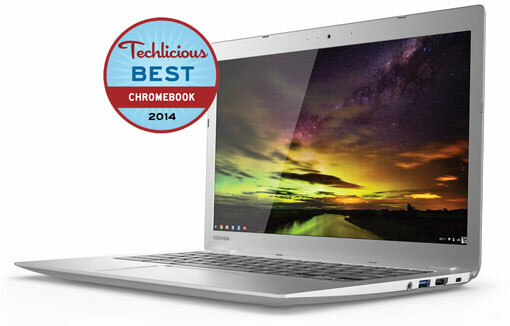 The Toshiba Chromebook 2 has all the qualities of a great Chromebook at an affordable price. If you’re on a tight budget, the $219 model CB35-B3330 with the lower resolution display and less RAM is a good buy. However, if you have the money, the $299 CB35-B3340 model is superb and well worth the extra cash. Either way you'll get the light, slim, attractive design, speedy performance, beautiful screen and comfortable keyboard. That's why it's my pick for the best Chromebook. As a MacBook Pro user, I wanted a smaller, lighter laptop since I have to travel a bit more now, but I did not want one with a poor screen—spoiled by the Retina screen I guess. Anyway, read a few reviews on the Toshiba Chromebook 2 and thought I would give it a try—and so far, so good. It is easy to carry and transport, certainly speedy enough for what I need it for when I travel (mostly work on the Web), and I do not feel that I lost much at all with the screen. Most of what I heard up to now gives Chromebooks a bad rap, but—and I am no expert—the Toshiba Chromebook 2, and I hope the next generation of Chromebooks will change all that. I use a MacBook Pro, also, and love it (for the most part). But for basic uses at home or for a light travel computer, saving over $1,000 and buying a Chromebook is a darn good deal. If you’re going to get the Toshiba Chromebook 2, get the Full HD IPS display. You’ll be glad you did. Otherwise, you might as well just go with the C720, it’s much more affordable with the less than spectacular 1366x768 display. The C720 has the 2955U Haswell processor which provides better performance. It’s nice to see Toshiba update its Chromebook offerings. Chromebooks are a great choice for education, as a second home laptop, or for users that spend most of their time in a browser and want a device that starts up fast and is easy to use. If you’re considering Chromebooks but also need access to Windows applications you can look at solutions like Ericom AccessNow, an HTML5 RDP client that enables Chromebook users to securely connect to any RDP host, including Terminal Server and VDI virtual desktops, and run their applications and desktops in a browser. AccessNow does not require any client to be installed on the Chromebook, as you only need the HTML5-compatible browser.